Looking for the best Amazon Fire HD 8 case for the 7th generation Tablet? Here, you'll find some Kindle Fire HD 8 cases (2017) that are the best buy not only because of their price but unique design. These are accessories which we've spent hours reviewing in a bid to determine their quality. They have received several recommendations on Amazon and as such, you can never go wrong in choosing them because of the positive feedback from those who have already purchased the product and are still using them. 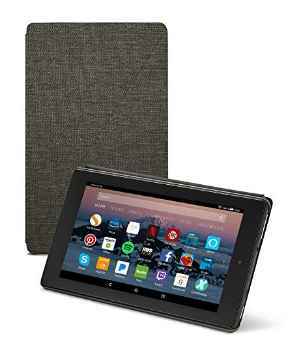 For their beauty, durability, and price, they are among the best fire HD 8 cases on Walmart, Amazon, eBay, and several other online stores. The Amazon Fire HD 8 (2017) is the seventh iteration of the Kindle Fire HD Tablet from the US-based electronics and e-commerce company, Amazon. It was first released in the US, UK, and Australia at a price of $79.99 (£79.99) for its lowest variant, making it one of the few tablets under $100. As an upgrade to the Fire HD 7, this is an affordable mid-range tablet that is reputable for its large screen and humongous memory storage. You'll find it rocking an 8-inch screen with a resolution of 1280 x 800 pixels and pixel density of 189PPI. There's also a 1.3GHz quad-core processor and a storage of either 16GB or 3GB each of which is expandable up to 256GB via microSD card. It sports a plastic back (in either blue, black, or yellow color) which is more prone to scratches, is not resistant to dust and water, and is less durable compared to a metallic build. Its dimension of 8.4 x 5.0 x 0.4 inches and weight of 7.2 ounces may require that you operate the tablet with two hands which translates into a large device that is not really portable. In both cases, a Kindle Fire HD 8 Case (for 7th Generation, 2017 release) may just be what you need. Now let's see if that's really true! The plastic build of the Kindle Fire HD 8 makes a casing a must-have accessory for this Tablet. It will protect the body from scratches, cracks, and other potential harm that may likely occur over time. Even a low-quality casing can provide the basic feature of serving as a shield around the device its used for, how much more getting the best out there that is also resistant to water and heat can do so much for you. It will prevent frequent slips and falls, reduce the impact of the Tablet in contact with the ground when it falls, and also help to maintain its new and sleek look for a long time. While a Casing for Tablet protects its outer build, it also enhances its capabilities. That is because some Fire HD cases are designed to have certain features that will help you to use the device efficiently. Magnetic strip to automatically wake up/sleep the device when the lid is opened/closed. There are several Amazon Fire HD 8 leather and hard shell cases in blue, black, red, pink, orange, purple and several other colors. Asides being available in different colors to meet your needs, you will also find each in different unique patterns. You get to choose between several designs and settle for the best casing that meets your fashion needs. In that regards, you can enhance the design of your Fire HD 8 Tablet just by using a casing. The use of a Case for your Amazon Kindle Fire can protect it from dents, dust, and water. If you can use one for your iPad, more expensive Tablets, and even smartphones, then you also need one for this low-cost Tablet. The Moko Case for all-new Amazon Fire HD 8 Tablet is distributed by the BSCstore on Amazon and it is suitable for this 7th generation Tablet and not the 6th Gen 2016 release or 5th Gen 2015 release. 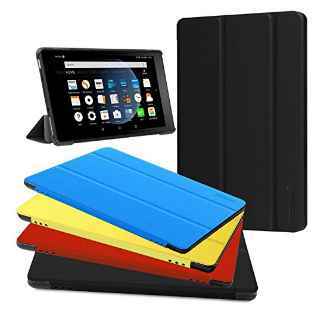 As one of the best folding cover cases for the Fire HD 8, it is popular among users of this Tablet and it has garnered several positive reviews which can be attributed to certain features other than its ability to protect your Tablet from scratches, dust, and bumps. 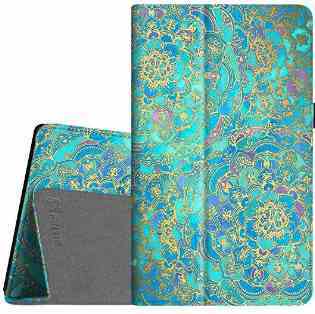 This is a leather case whose design is appealing since it is available in forest blue, black, rose gold, red, indigo etc. colors as well as flag designs for Argentina, Brazil, British, France, Germany, Italian, Spain, and the US flag. There is an auto wake and sleep feature that automatically wakes up the device when the casing's lid is opened and it also sends the Tablet into a sleep mode when it is closed. For ease of usage, there is a hand-strap attached to this casing which makes it easy to operate and hold with just one had. The Moko Case for Fire HD 8 features a dual-angle stand which allows you to place the device on a table by its own casing. This enhances your ability to type and watch movies without worrying about handling the device. The cutouts for the ports, camera, volume buttons on this casing are precise, hence the level of the device's functionality has been maintained. You will not have to worry about pressing the volume+/- buttons simultaneously or manually readjusting the camera's region since its already a perfect fit. In need of a casing similar to this? But with a removable physical keyboard to help you type faster? try the Moko keyboard case for fire HD 8. Want a rugged Fire HD case specially made by Amazon? Then you may want to check out the Amazon Fire HD 8 Tablet Case. Here's why it makes our list of top 5 Fire HD cases in 2018. The large build of the Kindle Fire HD 8 is no longer a problem since you can stand the device on its own using this casing. You can place it on a firm surface while you type documents, browse the internet, and watch your favorite movies and TV shows hands-free. Your hands can be busy with something else while your Tablet is serving the purpose of entertaining you with multimedia content throughout the day. This is a form-fitting fabric case made from durable woven polyester to shield your Tablet from any potential harm and keep your screen clean. The casing is integrated with a magnetic closure to automatically wake up/sleep your Fire HD 8 when the lid is open or closed. It also ensures that the lid stays in place and your Tablet's screen is covered when you're not using it thereby protecting the screen from water, dust, and even scratches. Keep in mind that this casing is not eligible for international shipping, hence it is limited for purchase for people living in the US. Fintie Folio Case for the Fire HD 8 Tablet is compatible with the Fire HD 8 7th Generation (2017 Release) as well as the 6th (2016 Release) and 5th generation (2015 Release). 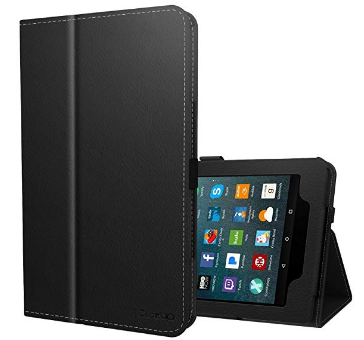 The slim build of this leather cover means it does not look like an extra weight around the Tablet and its soft inner liner and protective corners ensure that your Tablet is free form scratches. As with the cases outlined above, it also comes with a magnetic strip which wakes your Tablet once you open the lid and turns off the screen to save your battery once the lid closes. Available in black, orange, red, purple, navy blue, and several other colors as well as a Bohemian ledge, US flag, and Marble designs, you can get this wallet case in the design that meets your eye. You'll also find a smart holder as a compartment in this casing which serves to hold your stylus pen. For a hands-free viewing where you can just sit back and relax while watching movies from the best angle, this casing's cover can be flipped to form a horizontal stand. Not limited to only the Fire HD 8 2017 Release, the Zerhunt Fire HD 8 Case is also compatible with 2016's Fire HD 8. An ultra light and slim protective cover made from quality PU leather with microfiber interior and Hard PC Cover. The size and weight of the Tablet are not significantly increased allowing you to still handle the device easily with one hand. This comfortable layer of protection also ensures that your Table is dust-free and less prone to scratches. The Zerhunt Fire HD 8 Case can prevent slips and falls given the texture of its material which implies that it will be less prone to cracks that would've been inevitable. This casing can also wake up the device automatically allowing you to view notifications, weather updates, and the time. In the same vein, it can send the Tablet into a temporary sleeping mode to preserve the battery. With its multiple viewing angles, you can watch movies or read books from your Fire HD 8 Tablet conveniently since this is a foldable casing that can be made to form its own horizontal stand. Precise cut-outs for control buttons, ports, and cameras. 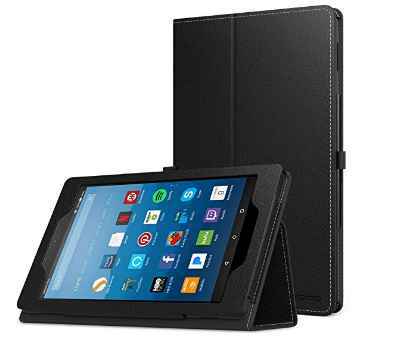 One more Amazon Fire HD case you should take a look at is the Ztotop Folio Case. For its price and quality material, it is one of the best buys out there. With $12.99, you can get a customized casing for the Amazon Fire HD 8 (7th or 6th Generation)Tablet which has an Origami stand, interior hand strap, and an auto wake/Sleep feature. The ability to fold this cover to form a landscape stand means you can enjoy content on your screen and type longer texts conveniently. With the Tablet well positioned on a Tri-fold stand, you do not have to worry about it slipping from your hand. The strap attached to this fitting casing means you can safely handle your Tablet with one hand and its magnetic closure will ensure that the front cover is closed at all times to protect the screen from dust and scratches. There's also a stylus pen loop to look forward to, as you do not have to drop your the pen in places you might end up spending hours searching for. The best cases for Kindle Fire HD 8 2017 on Amazon, eBay, and Walmart. You can also find each of these popular casings in reputable online stores in your country, hence location is not a limitation. Don't you just love it when your device maintains its sleek look and design? Free from dents, dust, and cracks even after a prolonged use? If that's a yes for both questions, then here's one more way you can ensure that your Amazon HD Fire 8 7th generation Tablet stays brand new.